AMSOIL LONG LIFE SYNTHETIC GEAR LUBES are compatible with conventional gear oils, however mixing oils reduces the benefits and nullifies the extended service life recommendations. AMSOIL LONG LIFE SYNTHETIC GEAR LUBES are compatible with most limited slip differentials. If limited slip differential chatter occurs, add AMSOIL Slip-Lock™ friction modifier additive. 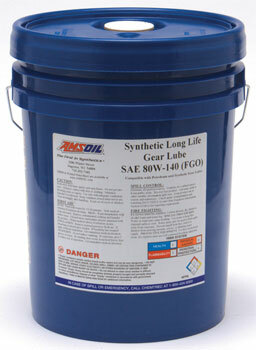 AMSOIL LONG LIFE SYNTHETIC GEAR LUBE 80W-140 replaces competitors' 80W-140 and 85W-140 viscosity grades.